The modern nation of Singapore is widely believed to have been formed by Sir Thomas Stanford Raffles (He is now a famous hotel in Singapore!) in 1819, and formally became part of the British Empire in 1824. 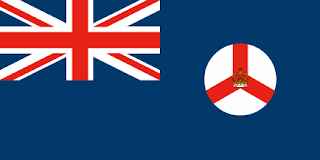 The colony had a blue ensign as its flag, which it used from the establishment of Singapore in the British Empire, through to near its independence. Singapore became the capital for Britain's Straights Settlements, which where all Britain's territories in the Malayan area. 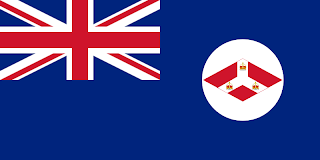 The Singapore flag was the blue ensign charged with a roundel featuring the coat of arms, consisting of a red diamond with a white upside down "Y" shaped stripe. Each of the three arms where charged with a crown. After the war, the flag was altered to give Singapore a unique flag, by taking the Straights flag, and reducing the number of crowns from 3, to 1. 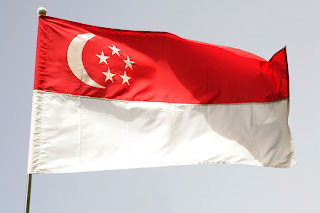 Singapore adopted its national flag of a red and white horizontal bicolour, charged in the hoist with a crescent and 5 star emblem. This flag was adopted as the new national flag in1959. However, Singapore gained its independence as part of the Federation of Malaysia. However, due to major ideological and unreconcilable differences, Singapore became an independent city-state in 1965. The bicolour flag became the flag of the new nation, with the crescent and 5 star emblem representing a young nation, its hopes for the future, and the unity of its many peoples. Interestingly, the ensign of Singapore is very different to the national flag. Whilst most nations create a naval ensign by charging another flag with their own flag, Singapore opted for a plain red banner. In the centre of the banner is a white disc with the crescent and 5 star emblem. However, the crescent is not facing from the hoist of the flag to the fly, but facing upwards.